When Google's Eric Schmidt testified before Congress on Wednesday, the first question came from Senator Herb Kohl, chairman of the Judiciary Subcommittee on Antitrust, Competition Policy, and Consumer Rights. And Schmidt responded with the sort of holier-than-thou attitude you find only at Google. "Google has acquired or expanded into internet businesses in many diverse areas, including travel, videos, and shopping, and now we hear you say Google wants to provide consumers with answers to questions, not merely links to websites that provide those answers," chairman Kohl said, in describing Google's monopoly of a search engine. "What do you say to those who argue that there is a fundamental conflict of interest between only providing unbiased web links and now providing answers, when you own many of the services providing the answers. As a rational business trying to make the most profit, why wouldn't we expect Google to favor its own products and services in providing these answers." Schmidt responded without hesitation. "I'm not sure Google is a rational business trying to maximize its own profits," he said, before referencing Google's 2004 Founders' IPO Letter. "Google is founded under a set of principles that are really quite profound within the company, and one of the most important principles is: Solve the problem that the consumer has. Ten years ago, the best answer may have been the ten lists we say. But the best result today may be that we can algorithmic compute an answer and do it quicker." Google wields the "do no evil" argument even on Capitol Hill, and in so doing, it continues to dodge some rather basic questions over the fairness of its "Universal Search" results. Both the European Union and the US Federal Trade Commission are investigating the company's search and ad practices. Google won't even acknowledge it's interested in making money – much less that its primary search engine drives traffic to its own vertical search services at the expense of competitors. Senator Kohl didn't accept the "do no evil" argument. "Is merely trusting Google to do the right thing sufficient, given your clear business incentives to maximize the value of your company?" he said. "Shouldn't we be guided by the words of a great president, Ronald Reagan, who said: 'Trust? Yes. But verify.'?" Schmidt agreed. But after Kohl and other senators spent the afternoon tossing questions at Schmidt, we're no closer to verifying much of anything. Google uses Universal Search to slot links to its own services amidst the primary "organic" results, but Schmidt did not directly answer questions over the fairness of the setup. If you put aside claims that Google isn't interested in boosting profits, the most breathtaking moment came when Schmidt denied that Google Product Search competes with price comparison service like Pricegrabber and Nextag. Google Product Search plays a major role in the EU antitrust complaint brought by Foundem, a UK-based vertical search outfit that offers price comparison as well as travel search and job search services. Foundem argues that Universal Search unfairly shuttles users to Google Product Search at the expense of other price comparison sites, but on Capital Hill, Schmidt dismissed such claims as "comparing apples to oranges". But Schmidt responded by arguing that Google Product Search shouldn't be compared to price comparison services. "There's a conflation of two different things going on here in this study, which I have not seen," he said. "Google Product Search is about getting you to a product. We tend to look for the product, as opposed to the product comparison in this particular case, which is why the product is more highly ranked than the result of a product comparison site. If you did the same study with all of the other product sites, you would find a very different site." In a blog post, Foundem questioned his logic. 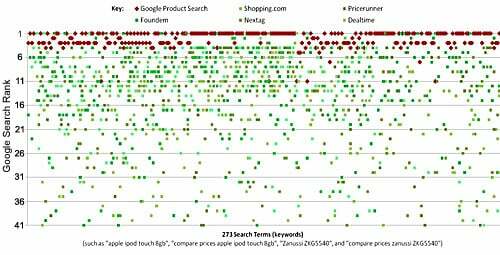 "If Google Product Search is not a price comparison service, then it begs the important question: why did Google Product Search show up so consistently at or near the top of Google’s search results for the hundreds of product-price-comparison-related queries shown in Foundem’s graph?" the company asked. "Why does Google’s Universal Search mechanism so consistently place Google Product Search at or near the top of most price-comparison-related searches, if Google Product Search is not a price comparison service? For example, hundreds of the data points shown in Foundem’s graph were for queries of the form: 'compare prices [MAKE MODEL]' and 'best price [MAKE MODEL].'" Schmidt also said that Google Product Search links that appear in its search results merely take users to third-party sites, but Foundem says otherwise: "Mr. Schmidt also suggested that if a user clicked on these prominently placed Google Product Search links it would merely take them to a vendor site. This is not true in most cases. In the vast majority of cases a click on these links takes users to Google Product Search – Google’s own ad-supported service – not to a vendor." Schmidt did say that he could not adequately judge the study unless he saw the technical details. Foundem acknowledged to The Register that it gave the chart above to Senator Lee. After our many conversations with Foundem and others involved in the Google antitrust probes over the past several months, it was obvious that the Senators were asking rather precise questions fed to them by Google competitors, but many ways, these competitors have some valid arguments to make. Schmidt did deny that Google has "cooked" its search results or that it "discriminates" against competing service. But when it came to the particulars, he was less direct. In other words, he said exactly what you'd expect him to say. Though he didn't quite seem to grasp all the issues, Senator Mike Lee's ultimate aim was to determine whether Google services are subject to the same ranking algorithms as third-party services. Presumably, in the case of Universal Search, they are not. But as Lee attempted, repeatedly to pry an answer from Schmidt, Schmidt repeatedly went back to the "we believe in the consumer argument" – or the rather bizarre notion that Google Product Search shouldn't be compared to price comparison services.